You are here: Home / Walker/Heisler/Orme/Harford / Who’s On First? I have a lot of ancestors that I’d like to have just five minutes with so I can ask them pertinent question of who’s your daddy. Okay, it’s usually more of a “who’s your mommy?” question. We all have questions for our brick wall crowd. However, we also have the list of relatives that we need more than just a couple minutes with so we can ask about the family stories. William Zed Walker is a man that I might need a few hours with if I were going to accomplish that one. My grandmother, mother, and uncle all had stories about William. We’ll talk about those, but first, let’s clear out the basic facts about the man. 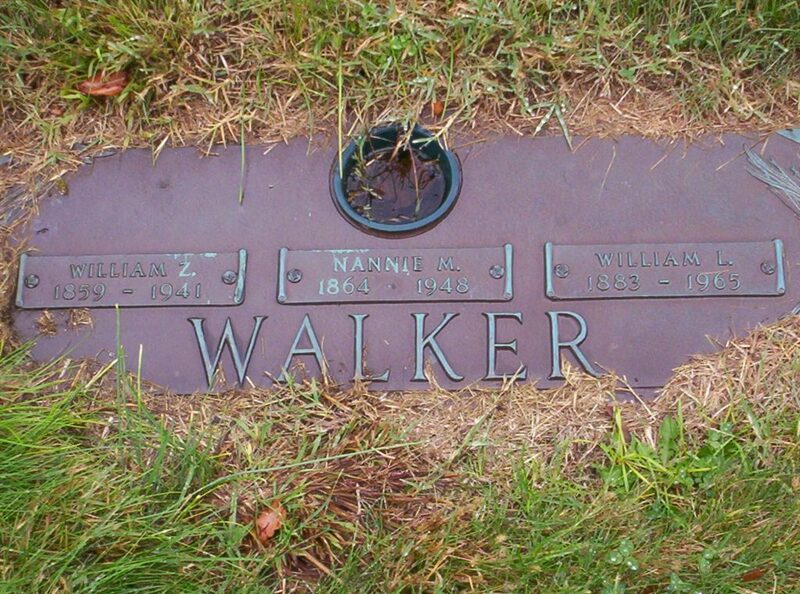 William Zed Walker was born 2 Aug 1860 in Philadelphia and baptized 9 Sep at the Church of the Redemption (Spring Church).1 He was the seventh known child of Abraham and Ann (Orme) Walker. They had nine known children together: William Leslie, Eleanor May, Edna, Frank Orme, John E., William Harry, Ralph, Marion Edith, and Ruth. I’ll discuss the children in the next post. Those are the basic facts. It’s everything between the birth and death date of these people that has made my cousins and me a little crazy over the years. The stories about William Z. are entertaining. The first story about him is that he was known as “Pete.” Even Nannie called him Pete. However, no one has been able to tell me why he was called that. Nor have I found any records, notes, or papers that referred to him that way. While nicknames aren’t unusual, we often know the history or story behind them, but we have no clue here. It’s one of those strange damn stories that linger long after the person has died and we’ll never find out why. I tend to refer to him as William Z to differentiate him from the many other Williams. When I asked my grandmother (his daughter-in-law Margaret) what he did for a living, I was told that he was loom man in the carpet mills. His father had been a spinner and weaver and that’s how William Z started. However, William Z had mechanical skills and hadn’t stayed in the spinning and weaving department. He’d become the man who fixed the looms and kept them running. My grandmother and mother always said this in a way that made it clear they revered his skill. Mechanical skills in the 1920s, 30s, and 40s were prized as they often meant jobs even in hard times. This is one of the few stories that I could verify. William Z is actually enumerated as a “loom fixer” on the 1900 Census. My cousins and I were also told two very specific stories throughout the years. The first one has really made us insane. My grandmother, who was not known for passing along stories that weren’t true, told us that William Z had played baseball and was friends with the great Connie Mack. When I was little, I remember seeing my grandmother’s photo album with pictures of William Z (as an older man) at the ball field with a man my grandmother said was Connie Mack. Those pictures of Connie Mack, matched other historical images that I have seen of him since. 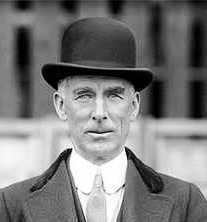 Connie Mack was a nationally known figure in baseball and hugely popular amongst the people of Philadelphia. My grandmother, Margaret (MacLean) Walker, said he’d been to William Z’s house for dinner back in the day and the two men had remained friends until William Z’s death. In the pictures, I believe they were from the 1920s, William Z had white hair and a mustache and looked a lot like Mark Twain. Those pictures disappeared years ago, so we can’t trot them out to show anyone with a clue. However, my uncle recalled them well so I don’t think I’m crazy in my memory. I’m also very realistic – having your picture taken with a guy, doesn’t mean you actually knew the guy, or that you played ball with him, but this was a consistent story in our family. Even our distant cousins that we’d never met until we began researching had the same story – Pete played baseball and was friends with Connie Mack. However, I have found absolutely nothing that supports this story beyond the ancient memory (both mine and other relatives) of the photographs that no longer exist. There are many wonderful sites that deal with the early years of baseball, but my searches have turned up nothing. I searched under both William Z and (just in case) Pete. The search continues. The other one is that William Z actually drew up a design for a cowcatcher on the front of a locomotive, but his friend bogarted the design and put in for the patent. If it was cowcatcher, then the story is absolute balderdash. The cowcatcher has been around since the 1830s, well before William Z’s birth. If it was some other mechanical item that he invented, I could probably get on board with the story. I am inclined to believe (without a lick of proof) that William Z could and did fix anything mechanical. All of William Z’s brothers and his sons seem to have been good with their hands and had an affinity for machinery. These men were not just spinners and weavers, but listed in numerous records as machinists, engineers, and mechanics. In the textile industry during that era, machinists and engineers were the men who operated and repaired the machines that produced the product. They’re the men with hands-on talent who can keep your mill in operation. The ones who didn’t work in the mills later became mechanics, carpenters, or general contractors. These were men who knew how to create, build, and repair things. That’s a nice line to come from. I’ll cover William Z and Nannie’s annoyingly hard-to-track-down children in my next post. Nannie and her family will be a separate series of posts. 1.Church of the Redemption (Philadelphia, Pennsylvania, Philadelphia County), “Church records, 1845-1956 Church of the Redemption, Episcopal, Books of George A. Durborow,” Baptism 9 Sep 1860 William Walker Born 2 Aug 1860; FHL microfilm 1,731,982, item 6-7. 2. 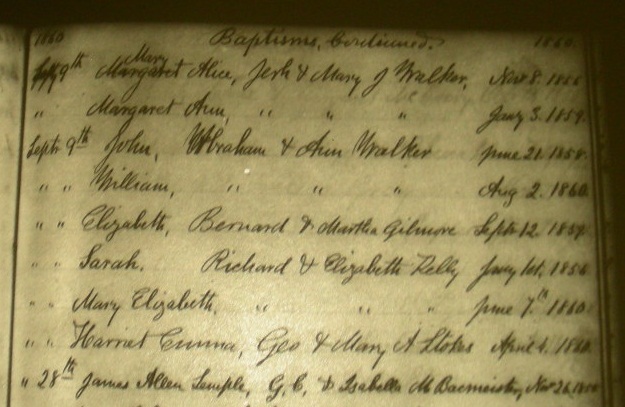 Church of the Redemption (Philadelphia, Pennsylvania, Philadelphia County), “Marriages 1875-1912,” 1882, February 14, William Walker to Nannie M. Heisler, ages 23/19, Rectory, Rev Thomas List, Witness: William Lucas & Annie Knight; FHL microfilm 2048217, item 1. 3. Pennsylvania Department of Health, death certificate 39291 (1948), Nancy M. Walker, born 10 Jan 1874, died 13 Apr 1948; Department of Vital Statistics, New Castle. 4. Pennsylvania Department of Health, death certificate 33947 (10 Apr 1941), William Zed Walker; Department of Vital Statistics, New Castle. 6. Pennsylvania Department of Health, death certificate 39291 (1948), Nancy M. Walker, born 10 Jan 1874, died 13 Apr 1948; Department of Vital Statistics, New Castle.